Mayumo is a Waray word which means "soft" in English. There's also a more popular Waray word for "soft" -- mahumok -- that is widely used in the Waray-speaking areas. Any Cebuano speaker will be able to immediately recognize the latter because it's almost similar to the Cebuano word humok which also means soft. 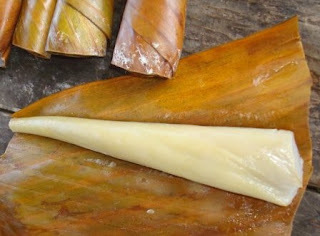 Sinarungsong from San Roque, Northern Samar. sinarungsong is well-known for its soft texture. When used as a modifier, the connector NGA is placed between mayumo and the noun word. When used in a sentence, mayumo needs other words like demonstrative pronouns (e.g., ini, sini) and possessive pronouns (e.g., imo, kanya). You have a soft heart. After you have set up your Blogspot blog, there's something else you should be doing aside from stuffing your blog with new content: adding gadgets to your blog. Are gadgets important to a webpage? Probably for someone who's new to blogging, you may not consider this very necessary. Adding a gadget or gadgets to your blog may increase a visitors' engagement with your site. Not only will they have the chance to read your posts, but they will also get to see other features from your blog's sidebars or footer, e.g., a list of your popular posts as well as the categories or labels of your posts. 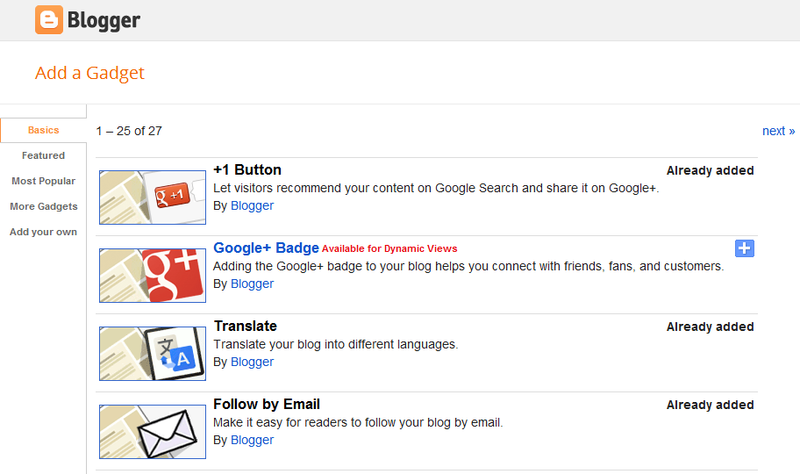 Log in to your account at Blogger.com and go to the blog you want to edit. Click LAYOUT. You will see it after clicking that arrow near the "VIEW BLOG" button. Choose the gadget you would like to add. Gadgets are grouped into four: Basics, Featured, Most Popular, and More Gadgets. There's also an "add your own" option at the bottom of the four groups I mentioned. 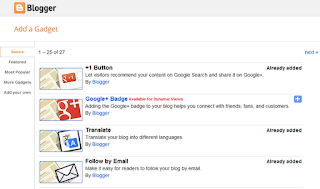 You can find the +1, Blog Stats, Followers, and Popular Posts buttons under the Basics group. After you have chosen the right button, click SAVE. You may move the gadget down by dragging the mouse. Once you have finalized the position of your newly-added gadget, click SAVE ARRANGEMENT. Here's one question that I'd like to answer through a blog post: How do you say "who is he?" in Waray? There are two ways of asking that question using the Waray language: you may either say (1) Hin-o hiya? or (2) Sin-o siya?. Notice that the two interrogative sentences slightly differ because of the letters H and S.
These two variations of Waray are usually referred to by the Waray language speakers as the H-Waray and the S-Waray. The S-Waray is spoken in Northern Samar and in Calbayog. While the H-Waray speakers use the following words: hin-o, ha, hiton, hiya in their language, the S-Waray speakers, on the other hand, use sin-o, sa, siton, siya, among others. These two Waray varieties also differ in how the English word "whose" is translated to Waray: one says "kanay", the other, "kunay." This post does not only give a series of "Who" questions, but it also has a "Whom" and "Whose" questions. For your convenience (I mean, if you're here because you're looking for some Waray translations), I have included the H-Waray and S-Waray versions opposite the questions in the English language. For more Waray words, you may visit the online Waray dictionary of this site. Who is with you? Hin-o an imo upod? / Sin-o an imo upod? Who are you? Hin-o ka? / Sin-o ka? Who said that? Hin-o an nagsiring hiton? / Sin-o an nagsugad siton? Who is your mother? Hin-o an imo nanay? /Sin-o an imo nanay? Who is your friend? Hin-o an imo sangkay? / Sin-o an imo sangkay? Who is she/he? Hin-o hiya?/ Sin-o siya? Who am I? Hin-o ako?/ Sin-o ak? Who are they? Hin-o hira?/ Sin-o sira? Who are your (singular) parents? Hin-o an imo mga kag-anak? / Sin-o an imo mga kag-anak? Who are your (plural) friends? Hin-o an iyo mga sangkay?/ Sin-o an iyo mga sangkay? Who ate the bread? Hin-o an nagkaon han tinapay?/ Sin-o an nagkaon sa tinapay? Who cleaned the house? Hin-o an naglimpyo ha balay?/ Sin-o an naglimpyo sa balay? Who came to the wedding? Hin-o an nakadto han kasal?/ Sin-o an nakadto sa kasal? Who sold the house? Hin-o an nagbaligya han balay?/ Sin-o an nagbaligya sa balay? Who sells cakes? Hin-o an nagbabaligya hin cake?/ Sin-o an nagbabaligya sin cake? Who loves me? Hin-o an nahigugma ha akon?/ Sin-o an nahigugma sa ak? Who is coming with us? Hin-o an maupod ha aton?/ Sin-o an maupod sa at? Who is coming with you? Hin-o an maupod ha imo (sing)/ iyo (pl)? / Sin-o an maupod sa im/ iyo? Who is Jimmy? Hin-o hi Jimmy? / Sin-o si Jimmy? Who is sitting in front of you? Hin-o an nalingkod ha imo atubangan?/ Sin-o an nalingkod sa imo atubangan? Who is sitting behind you? Hin-o an nalingkod ha imo luyo? / Sin-o an nalingkod sa imo luyo? Who is sitting beside you? Hin-o an nalingkod ha imo tupad? / Sin-o an nalingkod sa imo tupad? Who will help me? Hin-o an mabulig ha akon?/ Sin-o an mabulig sa ak? Who will sell the house? Hin-o an magbabaligya han balay?/ Sin-o an magbabaligya sa balay? Who will sit behind me? Hin-o an malingkod ha akon luyo?/ Sin-o an malingkod sa ak luyo? Who will sit beside you? Hin-o an malingkod ha imo tupad?/ Sin-o an malingkod sa im tupad? Who will love me? Hin-o an maghihigugma ha akon?/ Sin-o an maghihigugma sa ak?